Surrounded by people in all states of drunkenness and merriment, you inch towards the counter. You catch a glimpse of the beigels – pile upon pile of freshly-baked, golden brown rings of dough seductively beckoning you towards the counter. 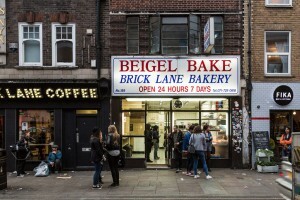 Open 24/7 and selling beigels for between 30p (plain) and £3.70 (salt beef), Brick Lane Beigel Bake is the destination for post-party, guilty-pleasure food in the area. 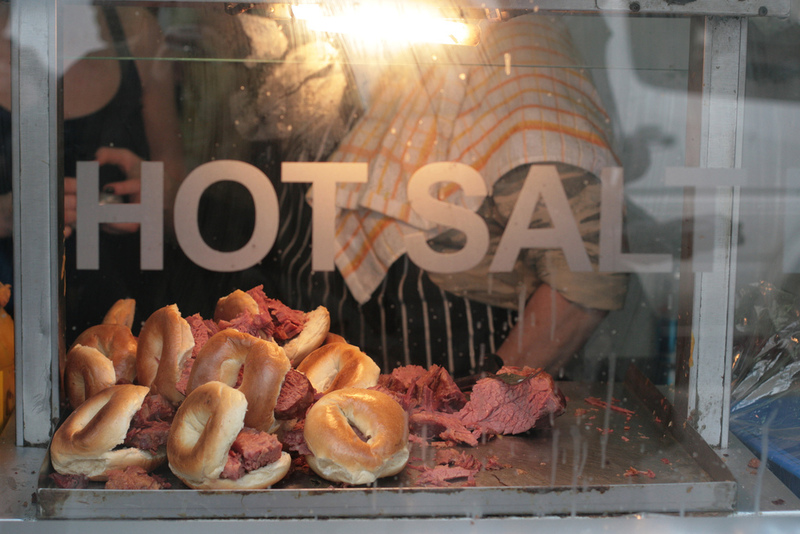 After all, there’s nothing better than a 4 a.m. salt beef beigel! Some online reviews of the bakery bemoan the long waiting time and curt service, but when I go into the shop on a rainy Wednesday morning, drenched to the skin, I experience a very different side of the bakery. 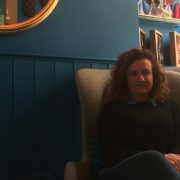 After approaching the two women behind the counter, the first thing I’m offered is a tea on the house, perhaps due to my looking like a drowned poodle. As I wait to talk to Nathan Cohen, 28, the son of Asher Cohen, one of the original founders, I survey my surroundings. The furnishing is spartan, functional. There are no tables or chairs for customers, just a long counter along one tiled wall, inviting a quick turnaround. 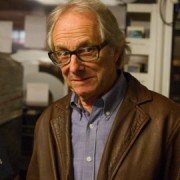 Despite that, the shop exudes a familial atmosphere, which made TimeOut proclaim it an “East End institution”. The women working the sales counter joke with each other and yell instructions to the bakers. “Hey, no swearing!” come shouts from the back. Among the steady flow of customers, there are many regulars whom the staff recognise. Well-meant quips are exchanged and lives are caught up on. As his father is one of the partners, Cohen has been coming to the shop since he was young, and he and his brother have been working in the shop full-time for about six or seven years. 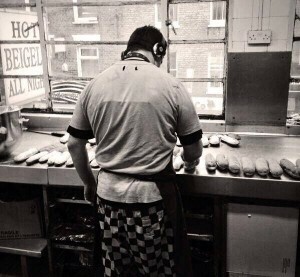 Beigel Bake started out as a wholesale business without much machinery, meaning that almost everything was done by hand and thus required work around the clock. 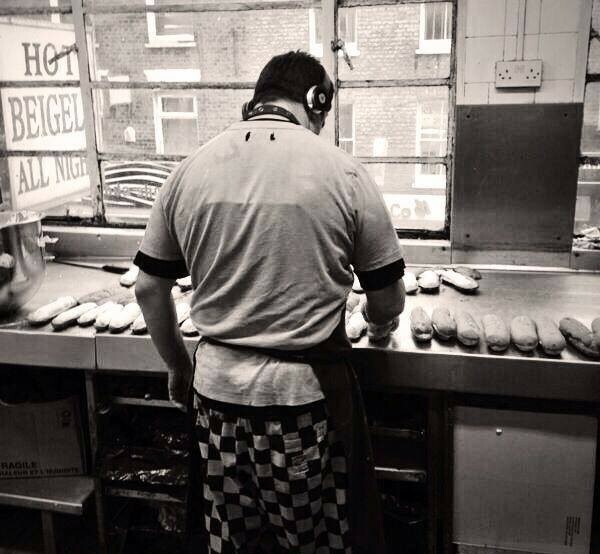 The shop’s beigels are not just spelled the traditional Jewish way but also produced that way. This means that, while the 7,000 beigels produced here every day have the same ingredients as any other, their dough is boiled before finally being baked to perfection. It is evident, that the longer-standing employees of the shop have almost become like a family. Just as we end our chat, an elderly man limps towards him and attempts to shake his hand, accidentally spilling coffee from the cup in his trembling fingers. Brick Lane Beigel Bake has the innate charm of a working class, family business which so many shops in the surrounding area painstakingly try to recreate through exposed brick walls, industrial decor and “personalized customer service.” But what you can’t fake is a genuine community that cares about others and each other. As part of the Photomonth East London International Photography Festival, there will be an exhibition by photography collective LDNtwentyfour7, showcasing 24 images of people visiting Beigel Bake around the clock, to celebrate how it brings people from the community, London and all over the world together. See it between 3-15 November at The Canvas Cafe, 42 Hanbury St.